Girls are born self-assured and bold. It is not a chromosomal thing that makes many girls shy about speaking up in class, hesitant to dive into competitive sports, or tolerant of street harassment. It’s not due to genetic makeup that women are less likely to run for political office, climb the corporate ladder, or attain equality–whether equal pay on the job or equal attention in the bedroom. It’s not nature; it’s nurture. Internalized social messages and conditioning by a sexist, often violent society are what contributes to any female suppressing her naturally confident, daring self and replacing it with less risk-taking, less space-taking behavior. Well, it’s time to deprogram. It’s time to reject all that keeps a woman quiet or unsure. Many girls are conditioned to downplay their abilities or needs so that no one else’s feathers get ruffled. Most women are taught not to push for or promote their own self-interests. This antiquated behavior has kept women back. What femininity needs is a boost of bravado. We perk up and take note when we hear about acts of female adventure and courage. They are stories we grab onto and delight in with others (“Hey, did you hear about the woman who…!”). We fix on these magnetic mental images and they become models of how we, too, can be in our lives (“If she can do it, so can I!”). So what we need are role models galore–down and dirty role models. They show what is possible. They show how to counteract the subtle and overt messages telling us to be “good girls” even when doing so isn’t in our best interest. Fortunately, role models abound. They are in every racial, cultural, and socioeconomic group, and in girls and women of every age, sexual orientation, ability, and disability. They are everywhere, because they are us. Many girls believe in their strength in spite of cultural conditioning. Women find ways to skirt around and overcome efforts to program them. Examples of resistance, bravery, and breaking-the-mold behavior can be found in every female.If courage creates ripples, get ready to be hit by a wave. That Takes Ovaries is a celebration of ourselves–girls and women just like you and me, speaking in our own words about our own actions. This is a celebration of everyday feisty females, those who haven’t made the history books or the cover of Time magazine but who have taken on the tired, false stereotype of the passive female. Their gutsy acts spur us to be risk-takers and heroines in our day-to-day lives. Then we, creating ripples ourselves, inspire them in return with our own daring deeds. “That takes balls” are words of praise reserved for a man who has done something bold: a guy we might respect for his ability to push the boundaries or break the rules, a boy with chutzpah. Well, move over, gentlemen, it’s time for the ladies! Some women need “ovaries” simply to survive in this harsh world. Others need them in order to flourish. But wherever an individual may fall on that spectrum, it is almost certain she will need to be a Woman of Ovaries if she wants to right wrongs, fight the injustices that still plague our communities, and gain her own freedom. Freedom, after all, isn’t simply about rejecting conditioning; in the end, it’s about dismantling the sexist institutions that promote the conditioning. We gotta be risk-takers to do that. Of course all stories are welcome here, whether they are about hell-raising social change or hell-raising fun. Either act can be a life-altering experience if a girl is tossing aside the rules of how a female is “supposed” to behave. Although some of the ovarian acts described here may seem too risky to you (and, in retrospect, they may seem that way to some of the people who did them), remember that the deeds were originally done with a sassy sense of valor and adventure. Of course some were also done out of panic and blind instinct, and some yielded unsuccessful results. The aim is not to showcase perfect women doing perfect, selfless acts–though we’ll witness some of those here, too. The goal is to showcase real women. Sometimes we make smart, calculated decisions; sometimes we take foolhardy chances. Either way, that takes ovaries! Excerpted from the book That Takes Ovaries: Bold Females and Their Brazen Acts, edited by Rivka Solomon. Excerpted by permission of Three Rivers Press, an imprint of Crown, a division of Random House, Inc. All rights reserved. Copyright © 2002 by Rivka Solomon. No part of these excerpts may be reproduced or reprinted without permission in writing from the editor. 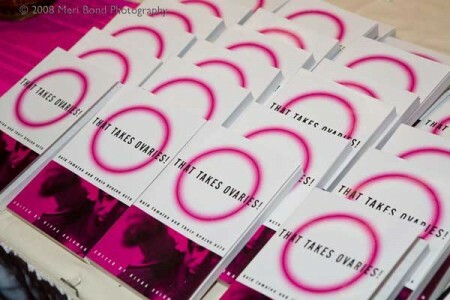 These stories are excerpted from the book, That Takes Ovaries: Bold Females and Their Brazen Acts, edited by Rivka Solomon. Excerpted by permission of Three Rivers Press, an imprint of Crown, a division of Random House, Inc. All rights reserved. Copyright © 2002 by Rivka Solomon. No part of these excerpts may be reproduced or reprinted without permission in writing from the editor. As I lay napping one lazy summer morning, a crashing sound jarred me awake. I got up to investigate. I opened the bedroom door, wearing only my short, pink, baby-tee nightshirt, and was immediately confronted with a man staring back at me. His hand was extended toward the other side of the door handle. I tensed up and said nothing. He did the same. Of all panicked thoughts, my priority was, I’m not wearing any underwear. “What are you doing in here?” I yelled, leaning slowly toward the man, fists balled at my side. With the foot of space between us closing fast, he backed up. Luckily, he did not choose the alternative. I bellowed again, “How did you get in here?” He turned nervously and looked at the open window behind him. The stack of games I kept piled under the window lay strewn all over the hardwood floor. Playing chips and dice were scattered everywhere, even under the furniture. Near the window leaned a shovel, which the intruder had apparently used to pry the window open, breaking the latch. It was my turn to pause. Then my answer surprised even me: “I’m not going to pay you for breaking into my house.” The shock of hearing this statement come out of my mouth completely distracted me from the fear surging inside my body. But it didn’t distract me from my primary concern, which remained, How the hell can I get a hold of some underwear? Burgle-Man stood silently, reflecting perhaps on our situation. While keeping my eyes fixed on Burgle-Man, I scanned the apartment with my peripheral vision. I was searching for my keys, my second priority. I’d need them to unlock the double-bolted front door in order to get him out. That was when I noticed my poster of Martin Luther King Jr. on the wall. I knew I needed to keep talking, and now Martin came to my aid. Burgle-Man’s chin began to quiver. Where were those damn keys?, I wondered. “It’s alright, Brother,” I told him softly. Who did I ever call “brother”? “If you start doing the right thing today, that’s what you’ll get to hold onto for the rest of your life.” Whatever that meant. Burgle-Man dried his tears while I spun my head around, looking for my keys. Of course, what I really longed for, needed, and had to have was my underwear. I could visualize the cotton fabulousness balled up in my dresser drawer just waiting for me. I hadn’t missed them so much since I’d messed in my pants in the second grade. “You cased my place?” I hollered, vaguely remembering knocks at my front and back doors minutes before the break-in. He must have seen the key through a window from the outside. “I’m sorry.” His chin started quivering again. I grabbed the spare key from the back door (which led to the backyard) and used it to open my front door. “Okay, good-bye,” I grimaced. “Are you going to call the police?” Burgle-Man asked. “I won’t,” he assured me solemnly, and retreated down the front stairs. I relocked the door and collapsed on my couch, my legs no better than rubber bands. I sat still for ten minutes, quietly looking at Martin, before I got up and hammered the window shut. But first I got dressed. Kathleen Tarr, a published legal scholar, a lecturer, a member of the California State Bar, and one of few Harvard Law School graduates who focused her legal career on eradicating racism and other oppressions, all the while refusing payment from her clients. For several years after the break-in, Kathleen slept with a knife. Having put the knife aside, she still never sleeps without underwear. One night, six years ago, I fell asleep an active, able-bodied young woman. Months later I woke up, my arms, belly, and back covered in burn scars. The legs that had carried me for years were missing, amputated above the knees as a result of my burns. The last few years have been a continual process of learning how to move and understand myself in this new, and yet old, body. Before my disability, I saw myself as a political activist only when involved in a demonstration or protest. Now, however, I understand my very body as a site of resistance. Every single time I leave my house, people stare. Their eyes linger on my scars, my half-legs, and my wheelchair as they try to understand what happened and why I look the way I do. Their stereotypes about disability are written in their expressions of confusion and fear as they watch me pass. I am powerfully aware that merely by living life in a wheelchair, I challenge their stereotypes about what bodies look like and what bodies do. I feel like an activist just by rolling out my front door. Sometimes, however, simply rolling outdoors isn’t enough of a statement. Sometimes you have to pee outdoors, too. Three years ago, during my first semester of graduate school, I took an exchange class at a local seminary. A month into the course, I was assigned to give a presentation on the week’s readings. Halfway through class we took a break, after which I was to give my talk. I desperately had to pee, and I rolled over to the library, sure I’d find accessible toilets there. I was met only with a wall of narrow stalls – too narrow to slide my wheels into. I dashed about campus, rolling from one building to another, hoping to find a wide stall door, muttering to myself, “There has to be an accessible can somewhere on this damn campus.” After checking every bathroom in every building, I realized I was wrong. Going home wasn’t possible because I would never make it back to school in time to give my presentation. “Holding it” also wasn’t possible because…well, when a girl’s gotta go, a girl’s gotta go. I exercised my only remaining option: I went outside, searched for a dark and secluded part of campus, hiked up my skirt, leaned my body over the edge of my wheelchair, and pissed in the grass…. It just so happened that the dark, secluded place I’d found was the Bible meditation garden! I went back to class angry. With mild embarrassment, I told the professor what had happened. I felt validated when she stopped the class to tell everyone the seminary president’s name so they could write letters demanding an accessible bathroom at the school. The next day, I, too, wrote a letter to the president informing him of both my accessibility problem and my solution. “Odds are,” I wrote, “I will need a bathroom again. And I am doubtful that my ‘christening’ of the Bible garden is a practice you would like me to continue.” In closing, I mentioned the Bible verse I’d found emblazoned on the garden wall (the one I’d practically peed on), and hoped its irony would not escape him. “Let justice roll down like waters,” the words proclaimed, “and righteousness like an everlasting stream.” Never before had the Bible seemed so relevant to me! Our conversation could only go downhill from there. Right. I’d forgotten how much we lady students, brains overtaxed by academia, liked to rest, bleeding, on musty couches in dank bathrooms. What a traitor to my sisters I must have been to suggest that my need to pee was more important than a couch that hadn’t seen human contact since 1973. About a month after the first incident, I fired off another letter to the president informing him of my continued use of the Bible meditation site. This time I meant business. I told him I was ready to expose his total disregard of the needs of disabled Americans by going to the press with my story. Bingo. Construction began on the most beautiful accessible bathroom you ever did see. Justice and righteousness were rolling down at last. They had just needed a little boost from a girl, her wheelchair, and a full bladder. Alison Kafer lives in the Los Angeles area and is a graduate student in Women’s Studies and Religion. In between battles with university administrators about inaccessible buildings, she kayaks, camps, and hikes. A relentless optimist, Alison insists that most people stare at her not because of her disability, but because of her southern charm and dazzling physical grace. Learning to skydive is electrifying. At two miles up (as in, in the sky), I smiled crazily at my instructor, a strapping Vietnam vet I called “Mommy,” let go of the airplane, and slipped into the utter freedom and excitement of falling through the air at more than 150 miles per hour. As I lay panting and pale-faced on the ground after my first jump, a seasoned skydiver who had heard my screams during free fall kneeled down beside me. “Congratulations,” he said. “You just experienced your first airgasm.” The sport of skydiving had initiated its newest adrenaline junkie; knees shaking, ears pounding, clothes damp with sweat, I hobbled to the ticket window to sign up for a second jump. Skydiving is never boring. Sometimes it is downright terrifying. But the initial shocks of adrenaline I experienced as a student soon gave way to the calmer pleasure of enjoying bird’s-eye views and mastering the art of flying my own body. So with 550 jumps under my belt, I decided to give skysurfing a try. Skysurfing has pushed the boundaries of skydiving, a sport in which risks are carefully calculated (honest). The pro who flies a fifty-five-inch surfing board through a series of freestyle spins, flips, and twists is regarded by some skydivers as a renegade, a lunatic. Sounded like my kind of sport! The prospect of leaping from an airplane with my feet strapped together on a stiff metal board brought back that familiar feeling of dread, which, I realized somewhat sickeningly, I welcomed. I called to schedule my first lesson. On a chilly Saturday morning, I met with Mike, a tall, athletic skysurfing pioneer who would teach me what little there was to know about this new sport that involved swooshing through the sky on an air-designed snowboard. Mike showed me how to strap into a puny-looking, twenty-four-inch beginner’s skyboard and accustom myself to the “trauma,” as he insisted on calling it, of having my feet restricted to an object that exerted its own forces in free fall. Should I find myself trapped and spinning uncontrollably under the skyboard, as skysurfers sometimes do, I had merely to yank on an emergency release that would send the board to Earth under its own mini-parachute. Now two miles up, feet bound to the board, I braced my arms inside the doorway of the airplane and leaned my body out against the cold, rough blast of air. I stared vacantly at the square plots of farmland below and the enormous blue sky around me, took a deep breath, and vaulted free to ride a 45-degree slope out the door. I held a downhill snowboard position for almost two seconds before the board unexpectedly pulled my body into a series of washing-machine twists and turns. As I fought furiously to regain control, Mike’s words about trauma drifted through my spinning head. A burst of adrenaline surged through my body, and I forced myself on top of the board. That’s when the ride got fun. My speed doubled and I darted through the sky, ears numb with the roar of the wind, face pulled back by the velocity, and eyes watering beneath my loosening goggles. Looking at my altimeter, I saw I was dangerously low. I instantly fell into the flat, free-fall position necessary for pulling. Unfortunately, this move forced the board above me. It acted like a demon rudder and I began vacillating and pitching roughly, too unstable to pull safely. Another bolt of energy shot through my bloodstream, and I was able to stabilize my body for a fraction of a second. I pulled. After my canopy popped open, I hung there, floating to Earth, wild-eyed and gasping. My second jump was more fun. After gaining the stand-up position, I leaned forward over the board, kept my back straight, and felt the sensations of lift and glide – of surfing. I did a few turns and generally just played with my new toy. Next I graduated to my “bigger board.” The wider, thirty-inch model was harder to control, but that meant a bigger endorphin rush and a more exhilarating experience of riding the sky. Learning to skysurf reminded me of learning to skydive. Both are about performing in spite of choking fear. Both give me the feeling of mastering my own body and busting past boundaries others respect without question. I enjoy looking around at the skydivers and surfers on the drop zone packing their parachutes, carrying their boards, and swapping stories. We come back weekend after weekend, forever infatuated with the charge that comes when we squeeze all the sweet juice we can muster out of life. To risk my life, after all, is not nearly as dangerous as to risk never really living. Elaine Marshall, a writer living in Switzerland, had trouble deciding which of her bazillion gutsy stories she should submit. Squatting with anarchists in England? Spending a winter in a Yosemite cave? Sleeping alone in cemeteries? In the end, the potential of “eyes full of blood and a face covered with purple dots” won.